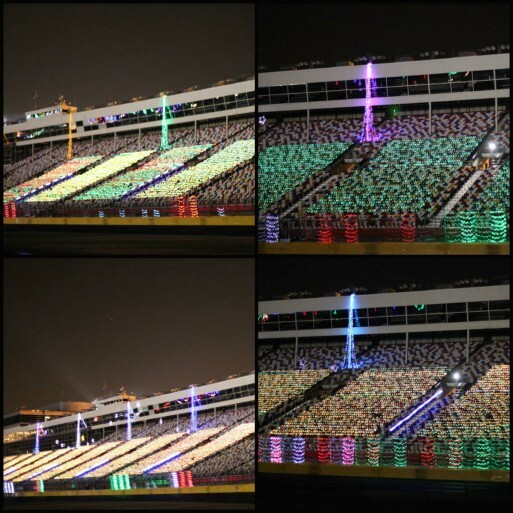 Speedway Christmas at Charlotte Motor Speedway features more than 3 million lights in 800 displays, an infield Christmas Village complete with Christmas movies on the world’s largest HDTV every Friday and Saturday night during the show and the the unique chance to drive the track. After missing out on a tour of Alberta, this was just the Christmas spirit that we needed. 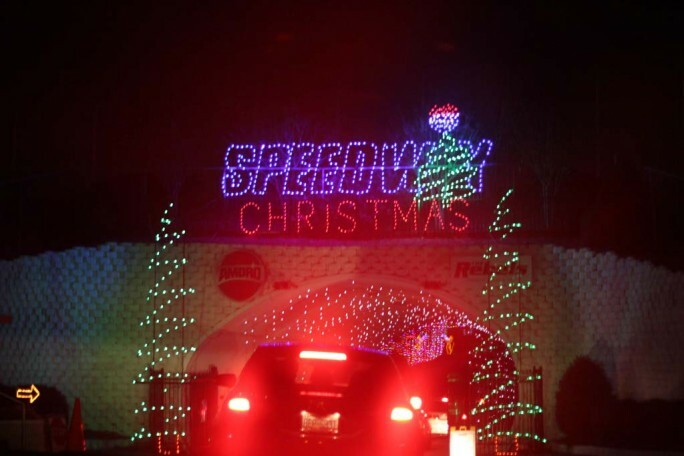 In it’s 4th year, Speedway Christmas could be the making of a new holiday tradition in the Charlotte area. 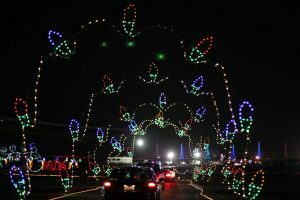 The entrance to Speedway Christmas is at zMAX Dragway on Bruton Smith Boulevard, and we could see the trail of lights as we made our way down the long, winding roads. Although we did pass displays during the wait, it took a couple hours to actually make it to the track. It’s totally worth what comes next, but be prepared. I’d suggest bringing drinks and snacks to make the wait more entertaining. When we entered the gateway to to the speedway, I felt as if I was on Rainbow Road from Mario Kart Racing. If you’ve played the game, you’ll totally understand what I mean. It was like driving through a time warp and when I entered the speedway I was back to my childhood, which was fitting since every second word out of my mouth was “wow” or “cool”. 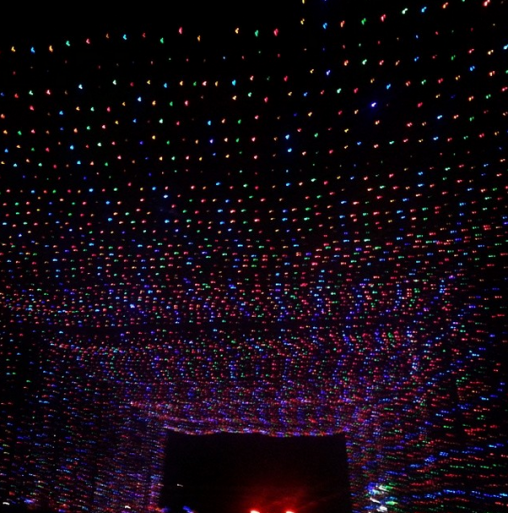 I was a kid amid 3 million lights. 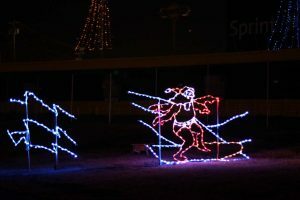 We passed light displays of Santa Claus, reindeer, Christmas trees, snow men, nutcrackers, and just about any imagery that comes to mind when you think of the holidays. Santa was driving race cars in one section and relaxing on the beach in another. It was magical to be surrounded by lights in all directions. One of the most unique parts of the experience was actually driving on the track. Even though our cars cruised at about 15 miles per hour, it was surreal to drive on a track where professionals reach speeds in excess of 200 mph. On the track, we had an amazing view of the speedway’s HDTV screen, the largest in the world. A Christmas Story was playing alongside us as we rode down Charlotte Motor Speedway. Even though it was getting late, we couldn’t leave without checking out the infield Christmas Village. We parked our van and walked around to see more attractions. There was a nativity scene with actors and live animals, vendor displays, photos with Santa, rides for kids, and a petting zoo. Athena’s head was on a swivel as she tried to decide what to focus on. As always, she was most happy in the petting zoo area. She loves being surrounded by animals. Her lack of fear for a toddler worries me as a mother. During the drive home, we listened to Christmas tunes and talked about our favorite displays. We unanimously agreed on every beach Santa and dreamed of “snowmen” made of sand. The wait was long, the bathrooms were few and far between, but the magic of 3 million lights in 800 displays was worth the wait. It instilled a sense of Christmas magic that will last for the rest of the season. I’d go just to drive on the track! Wicked! My husband and I went for the movie and missed it because of the wait but we did enjoy ourselves. It was entertaining. A nice night our for us. We took your suggestion and went. The kids loved it and we sang Christmas music the entire wait. It was fun for everyone.